When dealing with the safety of our loved ones, nothing should be left to chance; the slightest shortcut in quality to save a few cents can be the difference between a close call and a painful accident. Two recent lawsuits regarding finger injuries resulted in settlements of $725,000 and $600,000, respectively. NOTE: In neither of these instances was the finger lost...both were successfully reattached. Simple Safety Door Hinge Guards could have AND WOULD HAVE prevented this accident. Get Preventive & Protective Safety Door Guards to prevent finger injury, strangulation, aid as a dound, smoke and draft barrier, and protect privacy. Simple Safety Door Hinge Guards reduce your liability and their installation is proof of your concern for the health and safety of the adults and children in your facility, a leg-up not to be overlooked. 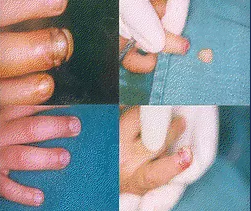 A three year old child had his ring fingertip amputated by bathroom door in a restaurant. 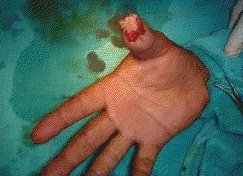 The amputated finger was successfully replanted by composite graft technique. Figure 2. 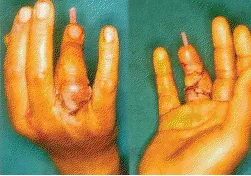 (a) amputated finger (b) after composite grafting (c) 2 weeks after surgery (d) 3 months after surgery.